Tsunamis are a series of large ocean waves generated by major earthquakes beneath the ocean floor or major landslides into the ocean. When the waves enter shallow water, they may rise to several feet or, in rare cases, tens of feet, striking the coast with devastating force. People on the beach or in low coastal areas need to be aware that a tsunami could arrive within minutes after a severe earthquake. The tsunami danger period can continue for many hours after a major earthquake. A tsunami can occur during any season of the year and at any time, day or night. 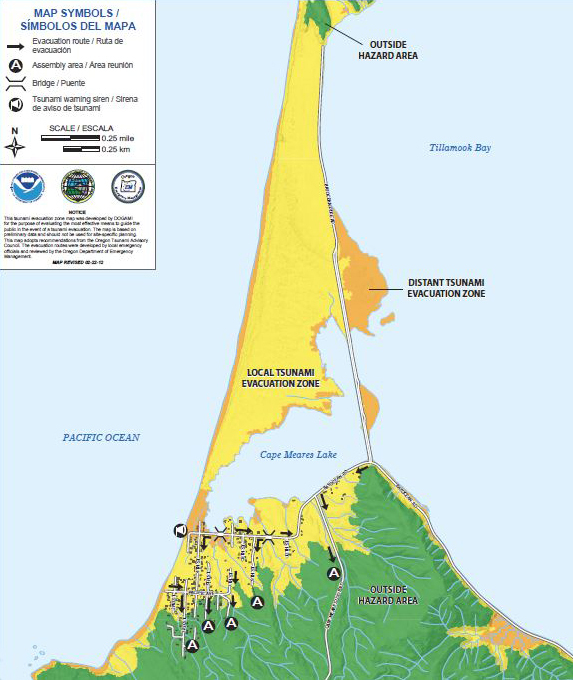 The Oregon Department of Geology and Mineral Industries made a presentation to the Tillamook County Citizen Corps Council in January 2015 that contains the latest Tsunami Hazard Information for Tillamook County. This document contains a wealth of information regarding the topic of tsunamis that is a “must read” for residents or visitors to Cape Meares. Below is a map of the evacuation zones for both distant and near tsunamis. For a distant tsunami (e.g., following an earthquake in Alaska or Japan), the areas in tan in the map show areas where the evacuation should occur. The assembly points for residents to flee to following a major near earthquake are shown in the map as the letter “A.” Maps are found throughout the community directing residences and guests to these locations. All of the locations are more than 80 feet above sea level. If there is a near earthquake where there is violent shaking for 3-5 minutes, all of the areas that are shown in yellow in the map represent areas that will likely be inundated and where it is important for residents to evacuate. Approximately 70% of all residences in Cape Meares will be inundated should there be a near earthquake that results in a tsunami. Use a NOAA Weather Radio or tune to a Coast Guard emergency frequency station or a local radio or television station for updated emergency information. Locate household members and review evacuation plans. Be ready to move quickly if a tsunami warning is issued. If you hear an official tsunami warning or detect signs of a tsunami, evacuate at once. Take your emergency preparedness kit. Having supplies will make you more comfortable during the evacuation. Take your pets with you. If it is not safe for you, it’s not safe for them. Get to higher ground as far inland as possible. Watching a tsunami could put you in grave danger. If you can see the wave, you are too close to escape it. Talk to everyone in your household about what to do if a tsunami occurs. Create and practice an evacuation plan for your family. Familiarity may save your life. Be able to follow your escape route at night and during inclement weather. You should be able to reach your safe location on foot within 15 minutes. Practicing your plan makes the appropriate response more of a reaction, requiring less thinking during an actual emergency. If the school evacuation plan requires you to pick your children up from school or from another location. Be aware telephone lines during a tsunami watch or warning may be overloaded and routes to and from schools may be jammed. Knowing your community’s warning systems and disaster plans, including evacuation routes. If you are a tourist, familiarize yourself with local tsunami evacuation protocols. You may be able to safely evacuate to the third floor and higher in reinforced concrete hotel structures. Return home only after local officials tell you it is safe. 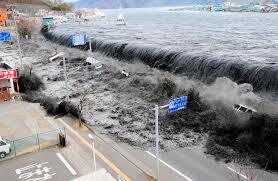 A tsunami is a series of waves that may continue for hours. Do not assume that after one wave the danger is over. The next wave may be larger than the first one. Avoid disaster areas. Your presence might interfere with emergency response operations and put you at further risk from the residual effects of floods. Stay away from debris in the water; it may pose a safety hazard to people or pets. Check yourself for injuries and get first aid as needed before helping injured or trapped persons. If someone needs to be rescued, call professionals with the right equipment to help. Many people have been killed or injured trying to rescue others. Help people who require special assistance—infants, elderly people, those without transportation, people with access and functional needs and large families who may need additional help in an emergency situation. Continue using a NOAA Weather Radio or tuning to a Coast Guard station or a local radio or television station for the latest updates. Stay out of any building that has water around it. Tsunami water can cause floors to crack or walls to collapse. Use caution when re-entering buildings or homes. Tsunami-driven floodwater may have damaged buildings where you least expect it. Carefully watch every step you take. Follow the evacuation order issued by authorities and evacuate immediately. Take your animals with you. Move inland to higher ground immediately. Pick areas 100 feet (30 meters) above sea level or go as far as 2 miles (3 kilometers) inland, away from the coastline. If you cannot get this high or far, go as high or far as you can. Every foot inland or upward may make a difference. Stay away from the beach. Never go down to the beach to watch a tsunami come in. If you can see the wave you are too close to escape it. CAUTION – If there is noticeable recession in water away from the shoreline this is nature’s tsunami warning and it should be heeded. You should move away immediately. Save yourself – not your possessions. Remember to help your neighbors who may require special assistance – infants, elderly people, and individuals with access or functional needs.